Summer Camp Showcase August 4 | 3:00 p.m.
Tickets will not be sold for this showcase. Free tickets will be evenly distributed to campers. Students in Greenbrier Valley Theatre’s summer drama camp experience intensive study in theatre arts. 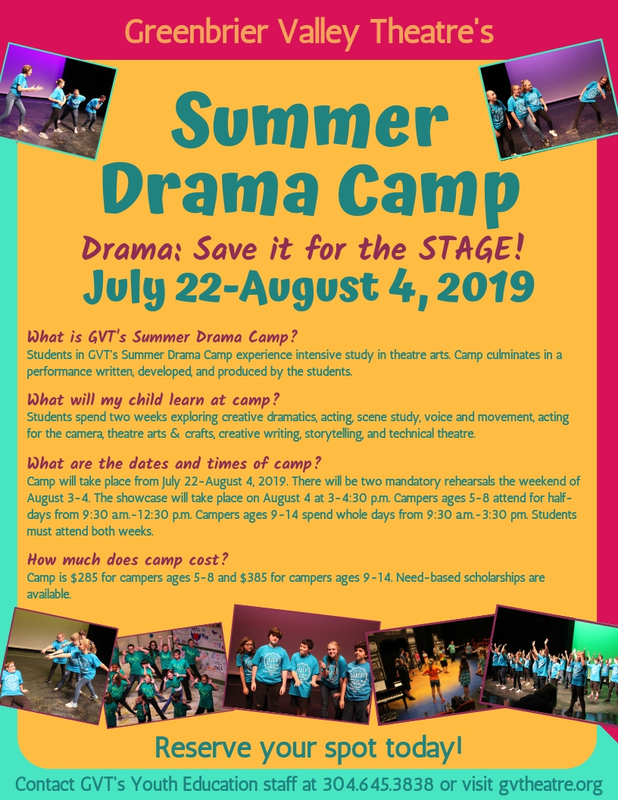 Campers ages 5-14 spend two weeks exploring creative dramatics, acting for the camera, scene study, voice and movement, creative writing, storytelling and technical theatre. Camp culminates in a performance written, developed, and produced by the students. There are 4 easy ways to register! Follow the below online registration button. Email a completed registration form, found below, to kiersten@gvtheatre.org. Mail the printed and completed registration form to P.O. Box 494, Lewisburg, WV 24901. Stop by the Box Office, Monday - Friday, 1 p.m. - 6 p.m to pick up or drop off your registration form. Questions? Email Education Manager, Kiersten White, at kiersten@gvtheatre.org.